1905 Envelope addressed to Manchester from Stockport franked by a Sheffield & Midland Railway 2d Green tied by a very fine Bredbury oval cachet in Violet. 1839 Entire addressed to Wymondham, Norfolk with, on the reverse, a very fine London LATE FEE datestamp, L40b. 1807 Front addressed to London from Colchester showing a very fine example of the Rare crescent-framed 'MORE TO/PAY' of London, L240a. 1858 REGISTERED NOTICE OF OBJECTION Wrapper from London TO BETHERSDEN, SHOWING A SUPERB PRE-PAID HANDSTRUCK 3 IN RED with a Tenterden cds on the reverse. 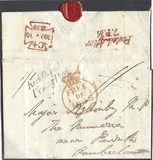 1861 MISSENT/to/HD&KN PACKET - 1d Pink envelope from Limerick to DUBLIN BUT "MISSENT/to/HD&KN" PACKET (HOLYHEAD AND KINGSTON), ROBS HKP 16. RARE. 1890 1d Pink envelope to London franked by a ½d Vermilion, SG 197, and tied by SUPERB CORNWALL R.S.T. (Railway Sorting Tender) circular datestamps, W 324. A Superb Late Fee item. 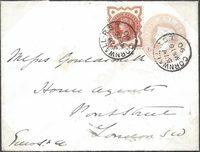 1871 Wrapper addressed to Westminster franked by a ½d Rose-Red, SG 48, Plate 6, tied by a fine Bridport '127' duplex. Alongside is a circular-framed 1D Postage Due of London. 1829 General Post FREE entire to London with, on the reverse, a SHERBORNE/PENNY POST, DT 525. On the front is a Boxed 'No. 3' Receiver and LONDON 'TO PAY 1D ONLY' in Red, L 810. 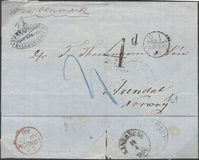 1868 Wrapper from Hull to Arendal, Norway, prepaid 8d, via London to Copenhagen (winter route) and showing a very fine Handstruck '4' in Black and Hull datestamp. 4d Due to Denmark. 1839 Small and Early envelope showing on the reverse a FINE WOODYATES/PENNY POST, DT 752 - RARE BEFORE 1840. On the front is a Thickthorne 'No. 1' Receiver and London 'ToPay 1Donly'. 1838 Cover addressed to London with, on the front, a Huntingdon/Penny Post, HN 66, together with, on the reverse, a Huntingdon undated circle, HN59. 1860 4d Rose-Carmine, SG 66, tied to entire from Glasgow to Bordeaux showing 'INSUFFICIENTLY/PREPAID' and oval 'PD' cancelled by the London Special Purpose '50' numeral - both in Red. 1865 Envelope from Glasgow addressed to Edinburgh showing manuscript "over ½ oz" and two 'Frying Pan' framed 'MORE . TO . PAY/GLASGOW/ABOVE ½ OZ'. 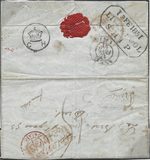 1738 Cover, side flaps removed, from Leominster addressed to Lincolns Inn, London, showing MS 8 cancelled by a very fine Inspector's ♔, L 155, changing rate to 1 N 1. 1837 Entire to London showing a Boxed IXWORTH/PENNY POST and LONDON "TO PAY 1D ONLY", L 814a. 1811 Piece with a fine Crown and Crescent MORE TO/PAY, L240, with postal charges of 1/8, 10 and 2 = 2/8. 1824 London redirected entire to Kensington and then to Portman Square showing Handstruck '3' ERASED and the new rate, Handstruck '6' "In All", L 634 and 638. SUPERB. 1880 ½d Rose, SG 48, Plate 14, tied to envelope to Edinburgh by a superb "GLASGOW N.P.B." cancellation in black; also showing, a framed "CONTRARY TO/REGULATIONS", handstruck "1" and circular "EDIN.N.P.B." ALL IN BLUE. RARE AND THE ONLY EXAMPLE THAT I HAVE SEEN IN BLUE! 1859 Notice of Objection entire showing very fine London framed 'NOTICE' and HANDSTRUCK '3' in red. Very Scarce. 1823 Cover from "Lucca" to London redirected to Dunvegan, Isle of Skye, showing a very fine framed NOT PAID in black, L 1111. Very Scarce. 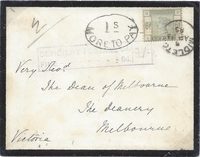 1840 Cover addressed to Beverley, Yorkshire, showing on the front, a YORK UNIFORM HANDSTRUCK Pd. 2 in Red, YK 3357. 1846 Unfranked envelope to Winchester cancelled at the top right-hand corner by a SUPERB KNARESBOROUGH 424 numeral and with a Manuscript 2 Postage Due.